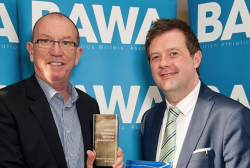 The British Athletics Writers’ Association has been a voice for the journalists and broadcasters who cover track and field for more than 50 years. Formed in 1963 in a drinking establishment near London’s White City Stadium to represent the press covering the sport, it forms a link between the national athletics federation, sponsors – and the athletes themselves – while co-ordinating accreditation, media availability and travel at major championships and events. BAWA’s annual lunch, held each autumn, incorporates the main awards for track and field in the UK with its past winners including all the great names who have graced the circuit. We also produce a regular members’ newsletter and organise occasional social events and receptions for members and other athletics journalists at home and abroad. In times of increasing access issues, the Association has strongly lobbied for open dialogue with those operating on and off the track. We hold an Annual General Meeting every year, usually during the UK Championships in June where the committee is elected. Membership of BAW entitled journalists not only to vote in the awards but also provides a range of offers and discounts on such items as meeting tickets and publications.